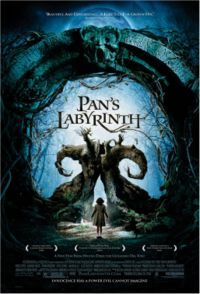 Last night I watched Guillermo Del Toro’s Pan’s Labyrinth on DVD. Having seen the reviews this was a film I had been waiting for with a great deal of anticipation. It was much darker than I had expected, particularly the scenes set in the aftermath of the Spanish Civil War (surely no coincidence that this was the same time as the D-Day landings in France). There is no attempt to disguise the realities of war. Choices are hard and can have consequences. The ‘other world’ also has its dark side but there is also the potential for transformation, but only after a series of tests have been successfully completed. In some ways this is a ‘Narnia’ for adults. Both films features themes of ‘disobedience and choice’. There are fauns and mythical creatures, a sacrifice that gives life and hope. The symbolism of the labyrinth and doorways into another, more magical (but still dangerous) world places the film firmly in the tradition of fantasy literature for the ‘childlike’ of heart so reminiscent of MacDonald himself. The ending is all the more effective for being enigmatic. We are left asking key questions of faith which I won’t spell out for risk of spoiling the surprise for you. I shall want to watch it again, preferably with the directors commentary. There are many layers at work here and it does not disappoint.